Ministers are attempting to boost Britain's trade with China as they tout for business and encourage investment. 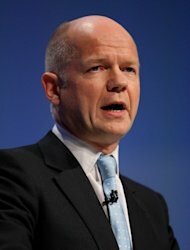 Foreign Secretary William Hague and Business Secretary Vince Cable will attend the China Business Summit as London welcomes the world for the Olympics. China, the world's second biggest economy and whose capital Beijing hosted the last Games in 2008, has rocketed from seventh to third in the league of nations launching inward investment projects in the UK over the past year. The Government hopes the Games will generate economic growth in double-dip recession Britain and is seizing the chance of world leaders descending on London to drum up business. Mr Hague said: "China Business Day represents a clear commitment to further strengthening the UK and China's relationship, building on our growing shared interests and working together towards mutual prosperity." Thursday's Global Investment Conference opened a series of summits to showcase the UK and attract business worth £1 billion. Friday sees the first of two meetings dedicated to deals with individual countries; the other summit will be held with business leaders from Brazil, which hosts the next summer Olympics at Rio de Janeiro in 2016. Brazil and China are two of the four "Bric" countries - the others are Russia and India - emerging economies set to become huge markets for global trade. Mr Hague added: "Commercial diplomacy - using our diplomatic influence to help boost growth and attract inward investment - is a key element for the UK's economic recovery and future prosperity. "It is at the heart of a huge amount of work occurring across the Foreign Office's worldwide network of missions. Engaging with the emerging economies is a vital part of this effort."